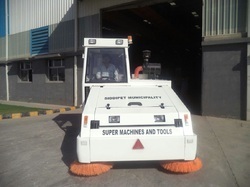 Self Propelled Ride On Road Sweeping Machine , 800 Liters Dust Hopper/collecting Capacity, With 2 Side Brushes And 1 Centre Brush. (vehicle Will Be Supplied With Full Registration To The Concern State. Electric sweeper is a professional solution especially suitable for cleaning , warehouse, garage, workshop roads, streets, scenic spots, campus, square, ground and so on. We supply high grade 3D Road Sweeping Machine through the use of latest available technology. Being aware of the industrial development, we develop our machines accordingly. Thy serve various purposes in the road construction industry. -120*130 cm machine dimensions; 120 l container capacity. 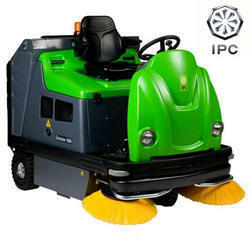 We are offering our customers an excellent quality range of Small Size Rider Sweeper. This sweeper is designed and made under the stringent guidance of our skilled and talented professionals following intentional standards of quality. Climbing ability up to	: 18 deg. Waste hopper capacity	: 300 lt.
Filtering surface textile polyester filter	: 8 sqm.